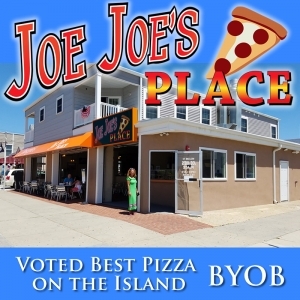 Joe Joe's Place - Voted Best Pizza on the Island is a family-owned and operated restaurant by the tight-knit, Irish-Italian Lerro family. No ordinary pizza shop, Joe Joe's serves the best and most innovative pizza at the Jersey Shore. Joe Joe's spins creative takes on traditional pizza for all to enjoy. We truly delight in making our customers happy with great food, an upbeat environment and friendly service. Whether you're in search of a casual meal for two, feeding the whole family with exceptional delivery deals, or looking for a late-night nosh - Joe Joe's is your place. We specialize in comfortable casual dining, delicious take out, speedy delivery, fun parties and creative catering. Joe Joe's philosophy is simple: Use the best ingredients to make the best food. All of our pizzas are handmade and we use fresh local produce. Its important to us to have consistency in our food while making every experience a special one. Joe Joe's is the perfect place to grab a slice after the beach at our counter or to enjoy a delicious dinner in our restaurant. This causal restaurant is a great place for a family meal. We also offer take out and delivery to your home or the beach. Located in the heart of North Wildwood, Joe Joe's is a fun, hip and eclectic environment sporting open-air seating. We're just as passionate about whats on Joe Joe's iPod as what goes in our pizzas. Open until 4 am, we're a great place to begin and end your night. We are kid friendly and love catering to large groups of families and friends. Call ahead to 609-522-0104 and we will have your table ready for you. Follow us on Instagram @joejoesnw and Like us on Facebook at https://www.facebook.com/joejoesplacenorthwildwood for fantastic specials and coupons.